Do you remember when you thought you were pretending, hiding your nature pretty well, I can …but we weren’t !! People could see right through us. Our lives speaking volumes about us. It is as if we were living in glass houses. Our lives can be pretty messy with anger, hatred, pain, guilt, shame and all kinds of filth, making our glass houses dirty. What happens when you shine perfect LIGHT through dirty glass?? When little light gets through a window what do we do?? We reach for a cleansing agent! We could not see what God had for us…. God is a gentleman He doesn’t force Himself on us. We were walking around clouded, foggy, wrapped in obscurity, misunderstanding, feeling separated. But when we ask Him to come into our lives HE WASHES THE GLASS HOUSE and makes it HIS HOME. And like any good home owner He begins to decorate and paint creating the home into His own creation. 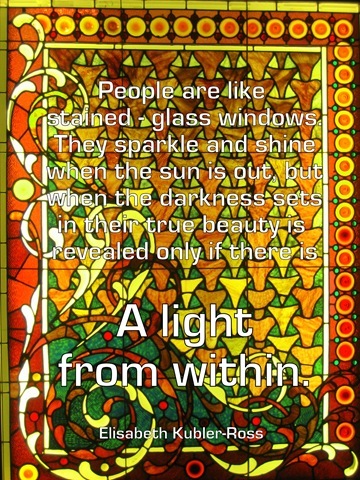 Every stained-glass window is unique and interesting, beautiful in its own right. Have you ever heard glass make music…like glass goblets being played??? The sound has tones of its own making harmonies of interesting combinations to hear. I wonder if our lives after Christ moves in start to vibrate the sound of HIM who is the PERFECT PITCH?? and we transform into a sweet sounds to GOD’s ears….a sound of harmony. 1 Peter 2:5 you also, as living stones, are being built up as a spiritual house, a holy priesthood, to offer up spiritual sacrifices acceptable to God through Jesus Christ. I do believe that I remember GOD inhabits our praises….and praise to HIM is a sacrifice of our lips!!! WOOT!